Figured we tweek this week's vintage finds Wednesday post a bit and look at some of the vintage Christmas baubles I have around the house. I like this Christmas couple because they remind me of me and Andrew Henry (I can barely remember being that skinny but thanks to a little bottle, I'm still that blonde). I'll let you decide which is which. Doesn't that one on the right kind of remind you of Kurt from Glee??? I mean look at that sassy collar. The winner of the necklace giveaway is Debby from Inspired Design! Congratulations Debby, please send me your mailing info and it will be on the way - jeanette(at)evertonterrace.com. congrats debby!!! And those little elfs are super cute...oh my goodness. Jeanette, your decorations are fantastic and full of personality....yep! the last guy really is Kurt! 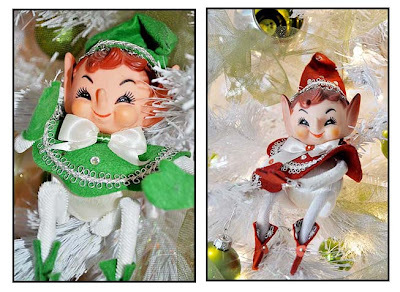 Darling, all those decorations are beautiful and the elfs so cute! Ps: I am hosting a charming scarf GIVEAWAY later today, just in time for cozy Christmas! 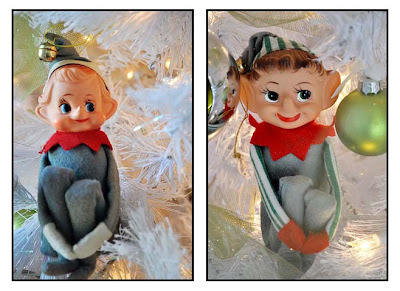 Love your vintage elves - adorable!! Fun! I went to a store with TONS of vintage stuff the other day. There were even old report cards! I have one of my Dad's old report cards! There are two felt elves dressed in green and red SOMEWHERE in my mother's house from when I was a child - not to self to locate them and adopt. my mom has vintage reindeer that hse puts out every year and I just love them! great finds! Love the mix! The full view of the elf tree is something to behold, they are perched just so! I have a collection of vintage, glass, tree decorations, beautiful Czech. ones and even some 'made in the U.S.A.'! I didn't put up my big tree this year but I have my vintage ornaments in a large Waterford crystal bowl on the dining room table. Yes yes, you're right. Mischievious is a much better word. You're house looks like a fun and comfortable place! And I agree, it doesn't get better than vintage mixed with modern! 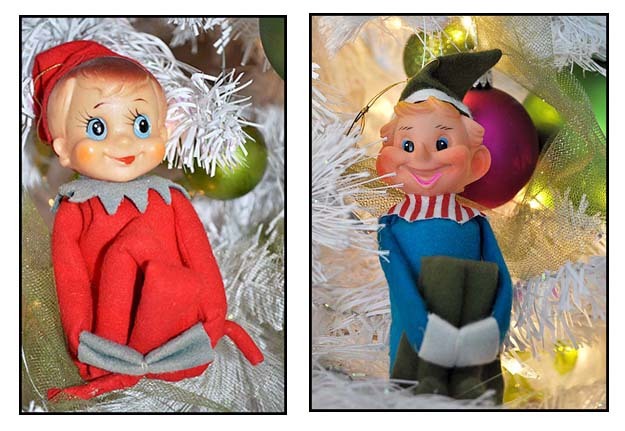 So cute, I love the little elves! Oh, these are all so adorable. I cant decide which one is my favorite! You always have the best finds!!! I don't usually find vintage stuff like that around here!! 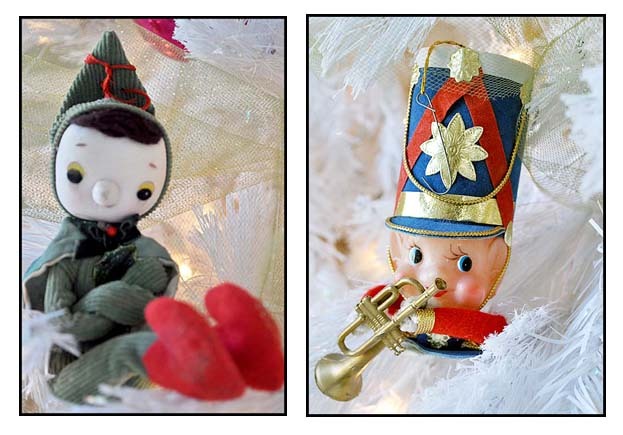 Lovely vintage finds and they certainly brought back my christmas childhood. The reindeer and trees are my faves! wow! so fun! can't wait to see it all decorating your beautiful home!! I loooooove those little trees! I have an early plastic Nativity scene, the sort I had as a child back in the 50s. I have it's original box and the pleasure I get in finding it again each year in amongst the other decorations is profound. That little deer is adorable! Your Christmas treasures are lovely...and those elves...adorable! Thanks for sharing the jOy my friend...Happy Thursday!